How a flexible, pre-tax benefit plan will slash your organization's tax bill and reduce your employee's medical and dependent care costs by 35%! If you want to rescue your company and its employees from much of today's payroll and income tax burden compliments of the IRS, a pre-tax benefit plan is for you. Every American Company needs to take advantage of a pre-tax benefit plan because of the tax savings it generates for both the company and its employees. Although flexible, pre-tax (cafeteria) benefit plans have been approved by the IRS since 1978, they have just scratched the surface in smaller organizations. If you are a small business manager and still do not have a pre-tax benefit plan option in your business or non-profit organization, you are throwing away cash and you risk losing your best employees! A flexible, pre-tax benefit plan, sometimes called a cafeteria benefit plan, can reduce your organization's payroll taxes (FICA and Workmen's Compensation), reduce benefit administration costs, and provide world-class income and FICA tax savings for your employees. With the right tools and knowledge you can out-perform the big banks and insurance companies as a benefit-plan administrator. You can spare your company thousands of dollars in benefit plan administration fees and even generate a sizable year-in and year-out income for yourself by administering a flexible spending plan for others, if you are so inclined! Tax experts encourage companies large and small to set up flexible medical spending accounts, dependent care reimbursement accounts, and tax-deferred 401(k) savings accounts. Doing so can save thousands of payroll tax dollars per year for the company, and will slash income and payroll taxes paid by their employees at the same time. This increase in takehome pay can help offset today's rising healthcare costs. A flexible-spending plan is a "win-win" situation for the organization and its employees, and is an absolutely required "perk" in today's competitive employment environment. Employee-oriented companies are always on the lookout for ways to improve fringe benefits and employee take-home compensation. Profit-oriented companies are cost-conscious and concerned with productivity and efficiency in their operations. At this web site you will find the information to let you achieve both objectives! With the FREE information here, your business or non-profit organization, whatever its size, can improve employee benefits, increase employee's take-home pay, reduce payroll tax expenditures, and reduce employee-benefit administration costs starting immediately! We are committed to providing you with all of the information, support, and tools you need to establish a smooth-running and cost-effective FSA plan in your company. Even though the big benefit plan administrators would like you to believe that the process of setting up and administering a flexible spending plan is complicated, it is actually very easy with the right information - and the information you need is FREE. (Just read on!) And it is all done with almost no effort or book keeping once it is set up correctly - and we'll show you how! So what makes us experts in flexible spending plans? We have been advising, setting up, and administering cafeteria benefit plans since 1987. Thousands of companies have downloaded our free, customizable summary plan descriptions to get jump started with their own improved, pre-tax benefit plans. Our FAST-FLEX PLUS software administration tool is used to do the bookkeeping grunt work for thousands of flex plan participants at hundreds of companies all over the U.S.
We know what works and we know all the time and effort-saving tricks. We started out writing PC-based software for flexible spending account administration. This software enabled companies of all sizes to set up and administer their own flexible spending accounts. Some of the nation's largest accounting firms, banks, corporations, and benefit administrators have purchased our software over the years. Maybe even more importantly, some of the nation's smallest businesses rely on our software and information services to compete on equal footing with the big boys when it comes to offering modern employee benefits. By working closely with our customers for over a decade, we have continuously improved our flexible spending account services and software. FAST-FLEX PLUS can interface with virtually any payroll system, reimburse qualified expenses according to your pay interval, and handle any combination of flexible spending accounts. FAST-FLEX PLUS includes the plan legal documents, participant enrollment forms, software, and training for self-administration of flexible spending plans. Timely, responsive service builds employee Flexible Spending Account participation levels. This leads to more payroll tax savings for your company. Your own company, not some distant and expensive administrator is in the best position to make certain that your plan is the best it can be. If you have a small business or work for one, you should not let another day pass without setting up your own flexible spending plan! 1/ Federal tax and FICA amounts calculated using the percentage withholding method. 2/ State tax withholding computed from tables. 3/ Full FICA withholding occurs during 12.0 months. 4/ Tax savings of $17.42 per pay period equates to annual tax savings of $418.12 per year. Tax savings estimate has been reduced by $0.00 dependent care credit. Please note: These are tax savings that repeat payday after payday, year-after-year. There is no reason to put off moving forward with your own flex plan another day! 1. Present a summary plan description to your company and employees. The summary plan description provides an overview of how a flexible-spending plan works. Supplement this with educational materials for the employer and all employees. A free Summary Plan Description is here. 3. Compute the total company payroll tax savings. Generally, these payroll savings more than offset any administration fees the company will pay you, meaning the program is almost always free to the employer! 4. Set aside the employee's designated withholding amount each payday. These funds are typically set aside into a flexible spending plan bank account by the company's payroll department..
5. Request reimbursements. As employees incur qualified medical and dependent care expenses, they mail or fax the receipt to the flexible spending plan administrator and request a reimbursement. Once a week, or however often you decide in conjunction with the employees, FAST-FLEX PLUS prints reimbursement checks on either your own check stock or the company's. That's about all there is to it! Once a year, a form 5500 must be filed with the Department of Labor to insure the plan does not favor highly compensated employees. Do not to worry about the filing requirements! FAST-FLEX PLUS makes end-of year filing a breeze, or if you prefer, our team of experienced legal experts will file your forms for you! But these flex plan administration tools must be designed from the ground up to automate the entire process: from employee enrollment to payroll system interface to expense reimbursement to reporting. Good flexible spending plan administration software is essential if you are to do a professional job of reimbursing your co-worker's qualified expenditures and do it profitably with minimal time commitment. Without the best software tools to automate the administration process, the time and money you spend will eat away your tax savings. You might even risk having your flex plan disqualified by the IRS! While there is no need to overpay for an industrial strength software system to administer flexible spending accounts, there is too much at risk to try homemade software built with a spreadsheet program. Likewise, you should avoid systems that are hard to install, that are hard to learn, and that charge you so much upfront and for support that they will eat all of your tax savings and then some! Why doesn't every company and non-profit organization already have a flexible spending plan for their employees? The main reason that more companies do not administer their own flexible spending accounts is due to all of the setup, recording, reporting, and check printing chores they fear are associated with "flex" plan administration. But not to worry! FAST-FLEX PLUS contains all of the educational materials you will need for the employer, employee, and the plan administrator to get a flexible spending plan up and running quickly in any organization. Now is the time to improve your employee benefits, start saving tax dollars, and stop wasting benefit plan administration fees. Recent surveys indicate that only a small fraction of America's employees work at companies that offer flexible spending accounts in spite of the fact that these IRS-approved programs have existed since 1978. Employees consistently rate comprehensive benefit programs as a key reason for accepting employment at one firm over another, so you want your benefit programs to be state-of-the-art in today's employment marketplace. But even when a flexible spending plan is offered, many workers fail to fully participate in cafeteria plans because the tax-saving benefits of these plans haven't been adequately demonstrated. Uninformed employees soon become an expense as a result of frequent turnover. You will be provided with all the information and tools you need to remedy this potential disaster! Serve your clients year 'round and increase your cash flow! If you own (or plan to start) an accounting, tax preparation, insurance, or other consulting service, you are in the perfect position to add benefit plan administration to your list of services offered. Using FAST-FLEX PLUS is an easy way to stay in constant contact with your clients, save them tax dollars throughout the year, and gain a year-round return from your consulting practice! Some of your client companies will already have a flexible spending account plans, but their employees and even the company itself may have become disenchanted by poor service from their current plan administrators. Many plan administrators actually put the burden of bookkeeping on the plan participants! By using FAST-FLEX PLUS to automate the entire administration process, the potential market for flex plan administration is almost unlimited! You can offer a service that every one of the 20 million companies and 135 million employees in America deserves! If you choose to become a third-party benefit plan administrator, you can begin collecting $3.00 to $7.00 per participating employee each month! The "going rate" that benefit plan administrators charge is $1.00 per employee per month for "premium-only" (POP) plans. POP plans mean that the employee-paid portion of health and life insurance premiums are deducted from their paycheck on a pre-tax basis. If the employee elects to also have out-of-pocket medical and dependent care costs deducted from his paycheck on a pre-tax basis, administrators typically charge $4.00 to $7.00 per employee per month. For every 1,000 participants in the plans you administer, your income is $4,000 to $7,000 per month! Remember, there is no limit to the number of employees and companies you can administer with one copy of FAST-FLEX PLUS! To make life even easier, FAST-FLEX PLUS can be installed on your network so that multiple operators can enter data, look up account balances, and print reports for any employee in any company - all at the same time! Postage costs to mail reimbursement checks directly to employees can be included in the administration fees you charge their employer, or reimbursement checks can be returned in bulk to the company for in-house distribution. 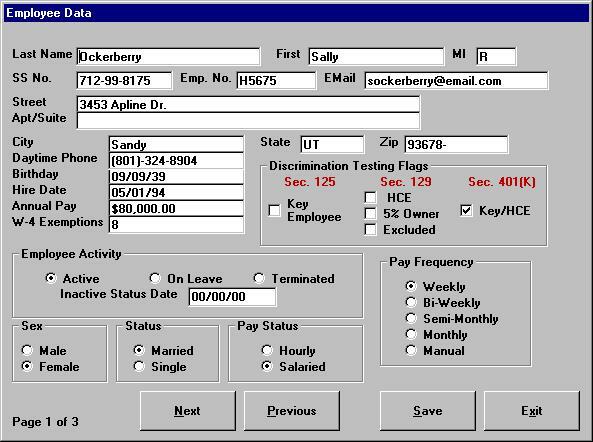 As a flexible benefit plan administrator, you can make thousands of dollars by using our software only a few hours a week. What other software do you use that not only saves you time, but literally puts money in your wallet every time you use it? FAST-FLEX PLUS is a complete, do-it-yourself software-based solution for flexible benefit plan implementation and administration. With today's increasingly diversified work force, employers can't afford to offer a "one-size-fits-all" benefits package. Employers will either pay for benefits an employee doesn't need or risk losing valuable employees whose needs aren't adequately met. Flexible benefit plans are the answer to this dilemma and are truly a win-win-win proposition for you, employees, and your company. We frequently ask ourselves why every business and non-profit organization in America doesn't already have a flexible spending account plan for its employees. Flexible spending account plans have been around for many years . Virtually every personnel department knows how "Flex" plans work and realizes that they truly are a "no-brainer" deal for both employees and the company. 1) Time. Companies are too busy to deal with yet another administrative task. 2) Cost. Third-party flex-plan administrators typically do a poor job for the fees they charge. 3) Trust. Businesses are rightfully nervous about sending large sums of money to an unaffiliated third party for repayment back to its employees. Poor software. Most flex plan administrators actually put the burden of tracking medical and dependent care costs back onto the employee. How do they do this? With limitations like these: "You may only send in accumulated reimbursement requests that total more than $50." Or, "Only twelve requests per year may be submitted, no more than once per month." Poor Account Information. Other administrators only send out year-end or quarterly account balance statements to the employees and company. By contrast, all FAST-FLEX PLUS reimbursement check stubs show current account balance and year-to-date expenditure totals. It also prints detailed quarterly statements and provides complete audit and account reconciliation reports that can be run at any time. Employees can call for up-to-the-minute account balance information. Account balance reports can be sent to plan participants by e-mail or published to the company Intranet. Poor Control Over Withheld Funds. FAST-FLEX PLUS offers several options to handle the transfer of funds from your company's payroll withholdings to the individual employee reimbursement accounts and then back to employees as qualified expenses are incurred. This provides the company with enhanced control over its employee benefit funds. The plain truth is, our software beats every other alternative for flexible benefit plan administration, regardless of how outrageously the others are priced! Before explaining some of the many features of FAST-FLEX PLUS, let me try to put the value of this software in perspective. Clumsy, mainframe-adapted competing products typically go for $5,000 to $20,000, but even at our affordably low price, you'll have everything you need to easily and successfully administer an unlimited number of cafeteria benefit plans on your PC. Besides that, our web-based marketing approach means that we don't have to feed an expensive marketing staff that "hound-dogs" you into buying. You won't have to hire a third-party system integrator to install it and you won't need to pay for days of training either. Our incredibly comprehensive, easy-to-learn, and incredibly low priced FAST-FLEX PLUS does the marketing for us. With our package, you can meet employee benefit needs, increase each employee's take-home pay compliments of the IRS, and reduce any company's payroll taxes and administration fees - with minimal time and effort! ·State-of-the-art, 32-bit Windows source code for greater data capacity and faster operation. ·Full debit-card integration makes reimbursement instantaneous and convenient. Account balances are always available on-line. ·Handles unlimited companies, divisions, and employees. We have a version to fit your organization. ·Imports employee names, addresses, etc., from almost any payroll or HR software. Saves hours of initial data entry. ·On-line, context-sensitive help gets you up to speed quickly. ·Comprehensive, on-the-fly, non-discrimination testing. No more bad end-of-year surprises! ·Generates HTML year-to-date statements that you can post to the internet or send via e-mail so that plan participants always know their account balances! ·Automatically checks for duplicate flexible spending plan reimbursement requests. ·Handles up to ten flexible spending or insurance accounts and (optionally) up to eight 401k-investment choices for each participating employee. The software has the capacity to grow with your business and changes in IRS laws. ·Built-in report generator provides a variety of management and employee reports at the click of a mouse button. Reports can be sent to screen, disk file, or printer. Time saving reporting features are built-in. No need to fire up the word processor or spreadsheet. ·Prints flexible spending account reimbursement checks automatically. Uses your own blank check stock. Also, can export to Quicken, Versacheck, or Direct-Deposit software in *.QIF format so that you can use them to print your reimbursement checks if you choose! ·Operates on any partial or fiscal year. You can start administering your benefit plan today! ·Automatically updates (posts) or imports paycheck benefit deductions to eliminate manual data entry. ·Menu driven. Requires no special accounting or computer knowledge. ·Self contained. No need to buy or learn another spreadsheet, database, or other software package. ·Applicable to all types of businesses - both profit and non-profit. ·Complete bank reconciliation and audit trail. ·FAST-FLEX PLUS comes with a complete, no-questions-asked, 90-day free trial. Use it and abuse it before you are ever asked to pay a penny. You just can't loose! If you want a flexible spending account up and running in your organization within 24 hours, click here to download Fast-Flex Plus right now! If you would like to speak with one of our representatives, call our office at (801) 544-2314. Please, before you call, list your questions on paper as our staff is very, very busy (we are all working crazy amounts of overtime to improve our products and market them effectively) and we want to be as efficient as possible in answering your questions. E-mail is an even more convenient way to contact us. We make a sincere effort to answer every e-mail within 24 hours! And if you still have questions, there is an excellent chance that we have them covered on our FAQ and self-help web pages. Your Guarantee: FAST-FLEX PLUS Pays For Itself Within 90 Days Or It Costs You Nothing! That's right. You have 90 days to use FAST-FLEX PLUS and convince yourself that it's the best way ever to slash taxes for your business and your employees. If FAST-FLEX PLUS doesn't pay for itself within 90 days, just stop using it! You will not be billed and you will owe us nothing! You won't even have to ship anything back because FAST-FLEX PLUS is delivered digitally. And, no matter what you decide, the FREE Summary Plan Description is yours to keep! So please don't hesitate. Every day wasted results in lost tax and administration fee dollars that should be going into your pocket!